Defender Jonathan Woodgate says he will play on loan in England this season. The Real Madrid star, 26, who has played just 14 games in two years because of injury, has been linked with Middlesbrough, Newcastle and Liverpool. "I'm going to go on loan for a year and I'll know which team I'm going to join in the next few days," said Woodgate. "I like all the English teams that want me and it would be a positive step to go back. I need to play games to show I'm strong and completely recovered." 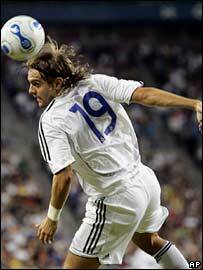 But Woodgate insisted he wants to stay with Real in the long term. "At Real Madrid it is difficult to have any continuity, but in a year I will come back to Madrid to prove that I am a good footballer." Woodgate joined Real on a four-year deal from Newcastle United in August 2004 for £13.4m despite suffering from a serious thigh injury when he was signed. He did not play his first league match for Real until September 2005. His debut was the stuff of nightmares when he scored an own goal and was sent off against Athletic Bilbao at the Bernabeu. Woodgate then picked up a series of injuries to his ankle and thigh. He was on the verge of earning a return to the England squad in November 2005 when he suffered a hamstring tear in a league match against Real Zaragoza. He failed to play again last season after suffering a recurrence of the injury in Real's 1-0 Champions League defeat by Arsenal in February. The arrivals of new coach Fabio Capello and Italy's World Cup winning captain Fabio Cannavaro have reduced Woodgate's chances of getting regular games at the club. He has played a total of 14 competitive games for Real since joining them two years ago, nine in the league, three in the Champions League and two in the King's Cup.